Get all 1300! Buy our English Grammar Worksheets bundle. Manuscript and cursive. Do you need printable Grammar worksheets for your kids? In many ways Grammar is really only a one year study, yet, if we begin when children are three years old like today's systems desire, then we'll have to teach the same Grammar many times in the beginning years. I wouldn't start till third or fourth grade. Then, it is good to have copywork so the children see how to write their sentences while capitalizing the first letter of the sentence and putting their own punctuation at the end of the sentence. If you begin later in the 6th to the 9th grade, one course is sufficient and from then on the kids simply "use" grammar in their original writing or when discussing something they've read. After having waded through many elementary English Grammar books through many years, I found that most Grammar books repeat themselves and fluff the material without giving simple exercises that model using the parts of speech. 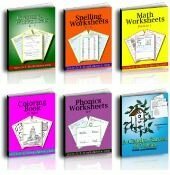 Since schools and homeschools require hours and hours of Grammar, I made our worksheets to be simple examples for little ones that are easy for teachers and parents to assign with their own programs. Our grammar worksheets are easy to print and easy to use and newly, they are also interactive. Practicing the use of the English language is the best way to learn its proper form, so we have created lots plenty of practice for little ones. Use our printable grammar worksheets to teach the different English parts of speech, grammar definitions, and the principles of sentence structure. They go great with our diagramming worksheets. Once you teach the definition and the structure, the children gain the logic for when they practice writing their own sentences. When beginners see how words fit on the diagram, Grammar and its logic begins to make sense. I am a huge fan of using diagrams while teaching grammar, and actually in teaching writing in general. Using a timeline is an awesome help, too, as it shows past, present, and future. Are you looking for a short cut to eight years of Grammar and just as many books? English lessons should capitalize on teaching the basics well because the basics are "most of it", especially for grades 4 through 6. Teach the rules as you go. Write sentences that make sense and show them why they "make sense". One of the best ideas I've ever taught is to teach the verb tenses with a timeline at the top of my white board! I explain that at this next link and added a printable chart for learning proper grammar with a timeline that shows the past, present, and future tenses in order under a timeline (not with the present first). I've even corrected the lists on this web page to have the past show before the present. Think of it. No wonder kids get the tenses confused if the present tense is continually being placed before the past tense in text books. I taught this to one of my high school daughters and her light bulb beamed! All of a sudden verb tenses made sense to her. We spent several days working with this using different verbs, one per day. My explaining the chart from the board and her copying it on her page made all the difference! See the explanation here. 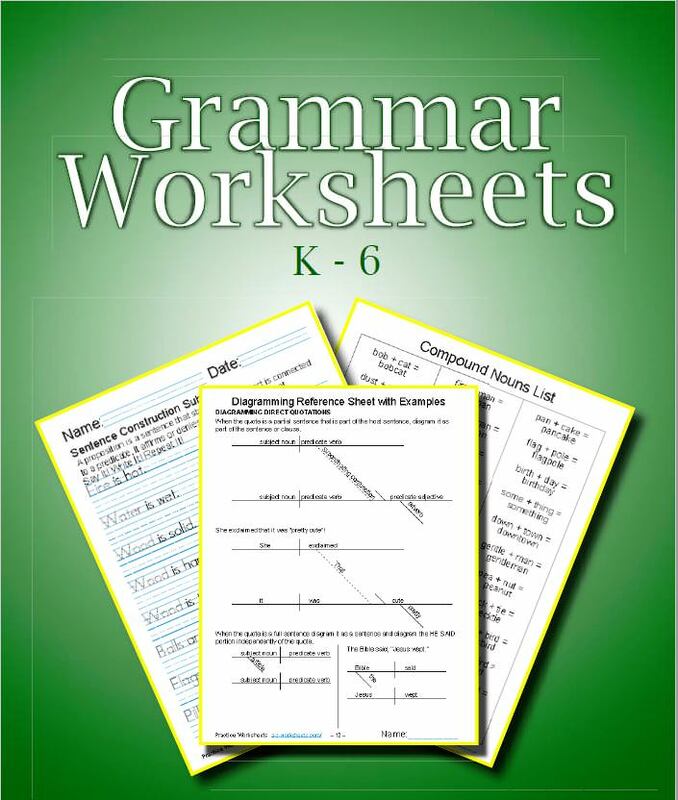 Printable Grammar Worksheets, diagrams, and definitions ebook. English parts of speech are word classifications, the name we give a word for its use in a sentence according to their meaning and use. There are generally nine parts or uses: nouns, pronouns, verbs, verbals, adjectives, adverbs, prepositions, conjunctions, and interjections. Our printable grammar worksheets are designed to teach sentence structure quickly. 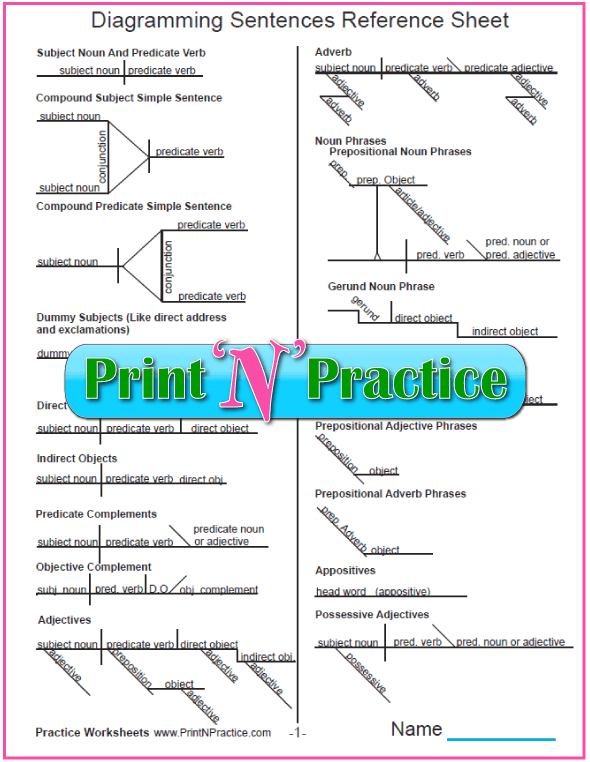 Choose them according to subject, linking verb, predicate, action verb, adjective, adverb, preposition and conjunction. When a student sees sentence construction as simple sentences expanding to become compound sentences and complex sentences, English grammar lessons begin to make logical sense. English lessons are simply exercises in learning the use of a word in a sentence and being able to name and define that use. Words like “personal” as with personal pronouns, and “relative” with relative pronouns still have the same meanings as in other English uses. Subject Verb Agreement is similar. Agreement means agreement. So nice! The rules of English grammar and the punctuation rules are mostly a matter of logic; they help the reader understand what the author wrote. Once a student has the correct grammar basics, teaching grammar and beginning writing is as simple as having your students write well frequently! Even small amounts of writing or copywork. Teaching grammar really can be quite simple. To wit, remember that the Harvey Grammar of old was ONE 120 page book. Yes, a tiny book! The principles of Grammar are simple. In the early days students practiced by copying their sentences till they knew them. Your kids can use our printable grammar worksheets to the same effect. A further help in teaching English lessons is in teaching the logic of correct grammar. Kids are relieved to find that English Grammar is mathematical. When we use a double negative, we mean a positive; and when we say something "is" then it is a definition or equivalent as with a mathematical equation. This is why I love teaching diagramming at the same time. There really is a "best" way to say or write an idea so that the reader understands precisely what the author wrote. The connections make the difference and diagramming shows those logical connections. There are no real levels of grammar; just a deeper use of the same rules, longer words, and longer sentences. Usually the descriptive words and parenthetical phrases are the main difference in levels. The rules of grammar do not change through the years, yet we do learn more as our correspondence and vocabulary become more complex. If your students are beginners, they'll love our Grammar worksheets. They make practicing the basics easy. Teaching writing to young students is much easier when there is an example of the words before the them that has the correct spelling and a correct sentence structure. Time to practice the grammar definitions and grammar rules is the secret to long term facility. Repeat the concept till your students are handy with it and move to the next while incorporating what has already been studied. Proper grammar requires some knowledge of the English capitalization rules and punctuation rules. Need an easy way to teach diagramming? My favorite grammar page on this site is our diagramming page. If we can see verbs of state as being like an equal sign = we can see definitions more easily. ...." so you can more easily understand the nature of the definition when the predicate defines the subject plainly. The logic of English grammar is nearly mathematical; it is as dependable as the truths of Math. For our ESL and Spanish speaking visitors, it is good to remember this about double-negatives: English double-negatives equal positives. For example: I am not going nowhere. This means that I am going somewhere. See our Grammar Definitions ebook here. Through the last twenty years I've used many different English lessons hoping to find a straight forward way to teach my students and children how to make sense of sentence diagramming. 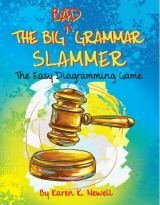 When it comes to making an orderly process that is explained well with an enjoyable format, Karen Newell has developed an easy English Grammar book that beats the others that I have used. Fun and no fluff. 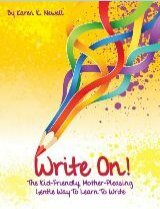 Her Write On is an awesome Creative Writing course for second through twelfth grade and works great with our printable grammar worksheets. Writing Road To Reading by dear Romalda Spalding and updated by Dr. Mary North. It has excellent technical information for teaching spelling, writing and reading lessons and has an excellent scope and sequence in the appendix. I love how it teaches correct grammar and composition together. Phonics Road by Barbara Beers is based on the WRTR and has a DVD set to train the teacher or parent to teach writing, composition and grammar. Harvey's Grammar is a short grammar book for those who only need a grammatical outline for teaching English.Remember that the Harvey Grammar of old was ONE little 120 page book. The principles are simple even if the book and testing companies have changed the names of the English parts of speech. Andrew Pudewa’s Institute for Excellence in Writing (IEW) has professional creative writing ideas and some free online writing courses that takes your students beyond the basics to the wonderful world of Structure and Style. Sound Beginnings by Julia Fogassy is a condensed version of Spalding phonics that we have found most helpful in that it cuts out the academic fluff. 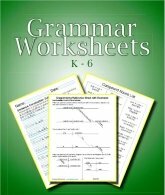 Looking for online Grammar worksheets? Ola's online English Grammar exercises give immediate feedback and even have hints! She also has wonderful books like "first readers" that explain the English tenses. She uses stories to help you understand the English tenses. Super idea! Check out Ola's site at Really-Learn-English.com where you can really learn English well.